As I mentioned in Part I of our travels to the Great American Southwest, Cedar City in southern Utah was one of the most typically American places I've ever seen. Being there was the most American I've felt in a long time, in the sense that no one stared at me or asked me to justify George Bush. A non-foreign American, Americanning around doing American things. It was fun for awhile, but I wouldn't want to live there. Following our day-long driving tour of the mountains, we needed something to do to entertain ourselves until dinner. So we decided to go bowling. It's not just because we're American that we decided this. It's also because bowling is probably one of the few activities available in Cedar City, and lucky for us, it wasn't league night. It was also the night of Homecoming for the university, so the bowling alley was nice and empty. A good thing, given that LE, in his Wiggles daze, had failed to take his afternoon nap. He didn't want to go bowling. He wanted more Wiggles. He was quite loud about this. But we took him bowling anyway. Once LE discovered that bowling involves balls-- lots of big multi-colored shiny balls-- he realized he was okay with it. Not that he's strong enough to lift a bowling ball. But that didn't stop him from trying to lift every ball that lined the racks behind the lanes. It didn't take him long to figure out when it was his turn, or that hitting lots of pins was good, while hitting a just few pins was ho-hum and everyone clapping for him was just being patronizing. On his first try, he hit nine pins, and then tried to run down the lane, at which point he fell on his bottom. 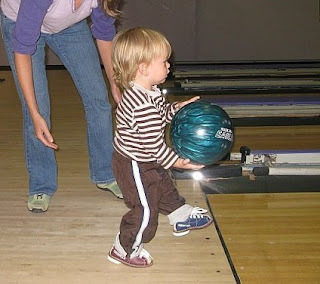 I thought the best part of bowling was that we were able to rent little tiny bowling shoes. So that was bowling. Sweet. My aunt and her family live in Las Vegas, where my mother was also born and raised. Trips to Las Vegas have never been anything like the TV show for me. As a kid, Las Vegas was mostly about going fishing with my grandfather and getting spoiled rotten by everyone. We always wanted to go swimming, and my grandmother was happy to take us to the pool at her neighbor's house across the street on the condition that we attended church and Sunday school. We didn't like either one. The only Sunday school I remember is a lesson where the teacher held up pictures of different things that God had made. She held up a picture of a whale and said "The white whale," but she pronounced it "hwite hwale." I thought that was really funny because I was like five or something. Afterwards, when we were invited to mention other things God made, I may have said that God made butts (or something to that effect), but it's possible that's just a made-up memory of something I wish I had done. Anyway, I just brought all this up so you don't go getting any crazy ideas about LE and I blowing it up on the Vegas strip. Vegas, to me, is about family time, though I admit someday I'd like to go there as a tourist and do the proper tacky, glitzy, over-the-top Vegas thing. They have lots of things to do there besides gambling, which is nice because, having grown up in Reno, gambling holds absolutely zero appeal for me. And nowadays they have these new-fangled slot machines that run on credit or something, so the sound of the casino, while still zany with exciting bells and music, was sadly lacking in the cheerful chink of coins falling into the slots' metal trays. Speaking of gambling, growing up I was always told casino floors were the dirtiest, nastiest places on earth, after airport floors and public toilet floors. 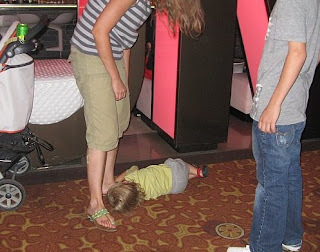 Here is a picture of LE throwing a fit on the floor of the Mirage. My mom was scandalized. And just for fun, I'd like to take moment to scandalize both grandmothers equally by including a picture of LE outside with no shirt, wet hair, and surrounded by dogs. Yes, yes, I know. Cutest.baby.ever. 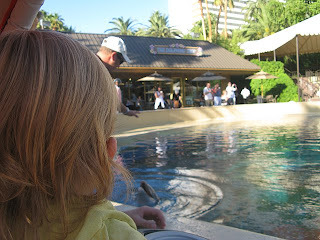 Fortunately for LE, the Mirage also has dolphins which was the real reason we were there. Determined as he was to throw his fit for the rest of the day, the dolphins pretty much brought an end to that. This was part of the Mirage known as Siegfried and Roy's Secret Garden. It is definitely not what came to my mind when I thought about what Siegfried and Roy's Secret Garden might contain. Since I was taking my little boy there, it's probably for the best. 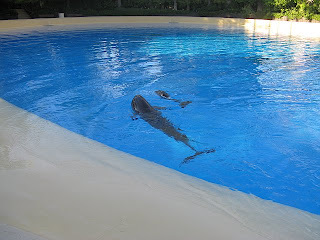 Another attraction of the Secret Garden was a baby dolphin, just 17 days old. Dolphins are cute in any case, so naturally a tiny dolphin is unspeakably cute. And this concludes our adventures in the Great American Southwest. As you can see, I've pretty much given up my self-imposed restriction on writing too many squishy, dribbling posts about my wonderful kid. I hope to have something a little more substantive to write about in the future, but until then, this will have to do. Ahhh that's fantastic, it sounds like you'r having a wonderful time here, and LE is getting to enjoy some ace experiences in America. I bet there are some things your don't miss about Turkey. I am due to have my baby tomorrow - I'm being induced, and my mum has flown over from the uk to support me (it'll be nice for someone to understand the swearwords) and also as she was a midwife way back when, she's a strong, take no prisoners kind of woman to have around- the perfect birth partner really. Oh Vicki, congratulations! I was sure you would have pooped by now-- poor you being overdue in the summer heat! You're probably in the hospital at this moment and I do hope all goes well. I would have loved to have my mom there for LE's birth, though I think you're mom sounds like a better birth partner. With my mom, I think I might have been tempted to just go "Oh, Mommy it hurts make it go away." My MIL is still mad that we didn't invite her for the labor-- we just snuck in for the induction and didn't call her till the sprog was out (this was the advice of the midwife and it worked fine). MIL is such a stress case though, I can't imagine what good she possibly could have done, except labor pains might have given me an excuse to smack her one. I hope yours doesn't make you too crazy, and I'm really sorry they ignored your request for a bit of privacy. The last thing you need right now is to be worrying about your MIL's feelings, and I just don't get why Turks can't understand this, that the birth belongs to the mother and not everyone in the world. I'd love to hear how it all goes when you have a chance. Please email me at istsstranger@gmail.com for a less public place. Fingers crossed, and congratulations to you all!! Eek! I wrote "pooped" instead of "popped." Freudian slip? Hehe.